Just across the Torres Strait, 150 kilometres north of Queensland, the winds of change are blowing through Bougainville. Despite being Australia’s closest geographical neighbour, women’s ability to participate in democracy in Bougainville is markedly different. Yet change is afoot as the final four Community Government elections for urban areas were held last month. These elections represent a critical moment for Bougainville’s path to a more inclusive society and for many women are the first chance to make an informed vote without the influence of men in the community. The Autonomous Region of Bougainville in Papua New Guinea is comprised of two main islands; Bougainville Island and Buka Island, along with numerous small islands and atolls. The region has an estimated population of 300,000, with the majority of the population living in rural and remote areas with very limited transport and telecommunications infrastructure. From 1988 to 1998, Bougainville experienced a civil conflict which resulted in the loss of more than 15,000 lives. The children of this period, who are now in their thirties and forties, are referred to as the “lost generation” as their access to education, health services and other basic needs was severely limited by the conflict. While the 2001 Bougainville Peace Agreement brought an end to the conflict, the long term social and economic impacts continue to disenfranchise voters, particularly women who experience multiple forms of discrimination and exclusion. In a region with the lowest level of women’s political participation in the world, Bougainville is leading the way. Yet, in the last national elections, not a single woman was elected to the PNG parliament. 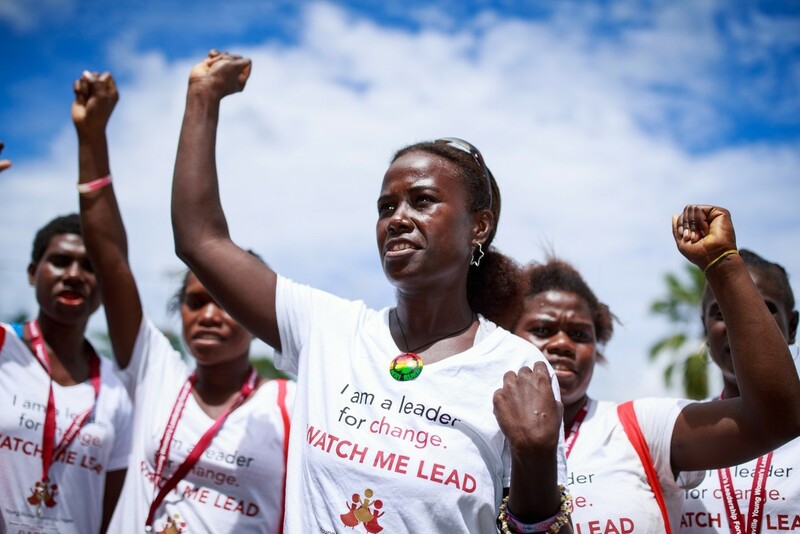 However, thanks to a strong movement of women leaders, Bougainville is taking important steps to ensure that women’s voices are represented in politics. Not only do they have three reserved seats for women in parliament, in July 2016, the Autonomous Bougainville Government passed the Bougainville Community Government Act which ensures that each Ward must elect one male and one female representative, and that the chairperson of each Community Government rotates between men and women. This Act is a powerful commitment to gender equality and is creating pathways for women’s leadership in local level government and beyond. In the lead up to these much anticipated elections, the Bougainville Women’s Federation (BWF), implemented a Voter Education Project to provide education about voting rights and responsibilities to communities across Bougainville. The Bougainville Peace Agreement guaranteed that a referendum would be held on the political status of Bougainville no later than 2020. The referendum is scheduled to be held in June 2019, when Bougainvilleans will vote on the question of independence from Papua New Guinea. Regardless of the outcome of the vote, considerable awareness and voter education is needed to ensure that people can make an informed decision, and that it is a peaceful and democratic process. BWF has been a partner of IWDA since 2012, working to empower women to uphold their rights and to be equal partners in decision making at all levels. In 2016 and 2017, IWDA supported BWF to implement the Voter Education Project, which provided communities in every district of Bougainville with essential information about their voting rights, electoral process and women’s right to participate. The project reached 43,884 people in the lead up to first round of Community Government elections and the PNG National Election in 2017. This staggering number represents approximately 15% of the population including women, youth and people living with disabilities who are often excluded from civic education initiatives. Over a 20-month period, 41 community trainers worked to deliver over 700 community voter education workshops throughout every district in Bougainville. 21 of the trainers were women, who have since become role models for women’s leadership in their district. Following this, six young women from BWF’s Young Women’s Leadership Project as well as BWF staff and community trainers were selected by the Office of Bougainville Electoral Commission (OBEC) as official election observers in 2017. OBEC has since invited BWF to observe two of the last four Community Government Elections in June 2018. A further 11 observers were participants in the BWF’s Young Women’s Leadership Project. In 2017, two of the 43 rural Community Government areas elected women as Chairperson. While we eagerly await the results for the final four Community Government areas, we reflect on the significance of women’s participation and leadership throughout the whole process. These achievements are a triumph for women and girls in Bougainville and indicate progress towards achieving greater representation of women in politics. Supporting peaceful, inclusive and democratic elections in Bougainville is critical in lead up to the referendum on independence next year. Women will continue to play a leading role in shaping a more resilient and unified Bougainville in the future. The Voter Education Project and Young Women’s Leadership Project are possible thanks to support from the Pacific Women Shaping Pacific Development Program, part of the Papua New Guinea-Australia Partnership.